As a revision manager, decrease the price of one of the products that uPlusTelco offers by creating a revision. 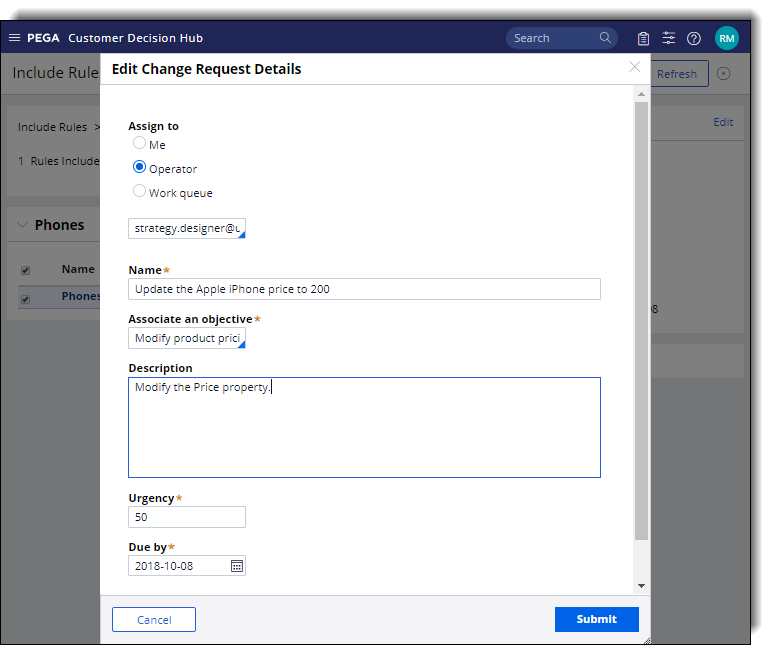 Create a change request to modify the Decision Data rule that holds the propositions that belong to the Phones group by creating a change request. Assign the change request to the strategy designer. Create propositions that represent products that the company offers to customers. For more information, see Creating a business hierarchy of propositions. Specify the revision objectives, priority, and the completion due date. Log in to the Customer Decision Hub portal as a revision manager. Click Revision Management landing page. 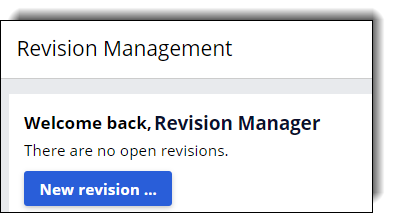 On the Revision Management landing page, click New revision. 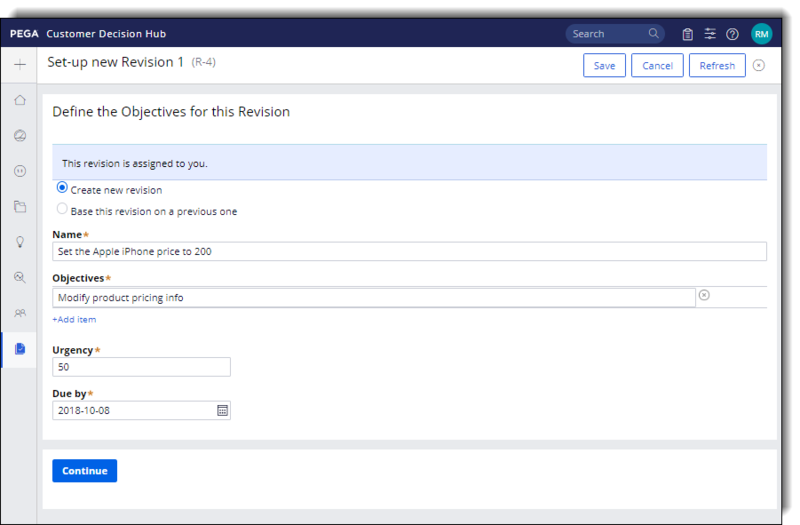 In the Set up new revision screen, make sure that the Create new revision option is selected. Enter the name of the revision. Optional: Define the priority of the revision by modifying the Urgency setting. The lower the urgency value, the more priority is assigned to the revision. Optional: Assign the deadline for completing the revision by configuring the Due by setting. Confirm your settings by clicking Continue. To add a proposition that represents a new product in the company's offer, define the rules to include in the revision and create a change request. 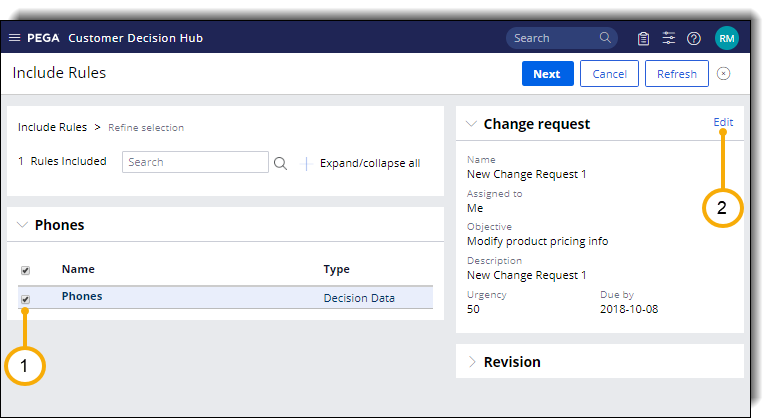 Assign the change request to a business user. You can create multiple change requests as part of a single revision. In the Include Rules screen, select the rules that you want to include in the revision. For example, select a Decision Data rule that contains propositions. In the Change request section, click Edit. In the Edit Change Request Details window, in the Assign to section, select Operator. From the drop-down menu, select the operator that you want to assign to the change request. Provide the name of the change request. Optional: To associate this change request with an objective that is different than the revision objective, modify the Associate an objective field. Optional: In the Description field, provide additional details. Optional: Define the change request priority in the Urgency field. Optional: Define the completion deadline for this change request in the Due by field. The default value is seven days. Confirm your settings by clicking Submit. As a strategy designer, open the change request that was assigned to you and update the required rules. For more information, see Completing change requests.